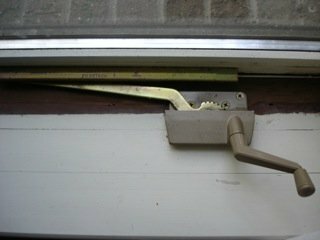 Do you have Truth hardware on your casement window ? You probably do. Truth window hardware is used by hundreds of window manufacturers nowadays. Only problem is what do you when you try to crank out the window and nothing happens ? How do you go about fixing these window operators ? Let me delve into the replacement of some common models so you can see whats involved in getting your windows opening and closing again. A casement window is the style of window that opens like a door with hinges on the left or the right. Truth window hardware makes both the hinges, which are located on top and below the window, and the operators which are the window opening devices the crank handles are connected to. Window operators are fragile. If the window is sticking and you crank too hard on the handle, the operator can be damaged. You may find the handle spinning in your hand with the window going nowhere. To make things worse, if you have a wooden casement the manufacturer often staples wooden trim over top of the operator and paints it. Making it difficult to get at the operator to replace it. Vinyl windows can be easier, because in many cases the window operator has a cover that just snaps into place over the operator. The picture above shows a window operator with the wooden cover removed. This is a single arm operator. 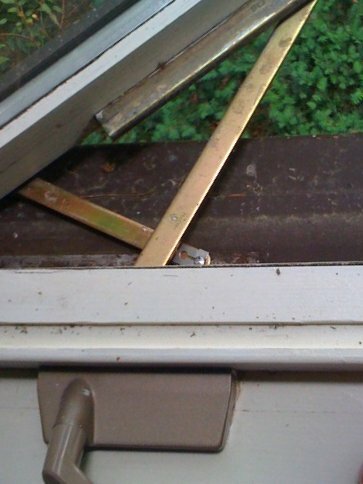 To replace the operator, you remove the four screws which go through the operators baseplate into the window sash. You then slide the nylon roller on the end of the arm along the rail mounted on the window. Slide it until it can be pulled out through one of the notches in made the rail. Most window cranks fail because too much force is placed on the worm gear contained in the housing just behind the window crank. The red arrow in the picture shows where the worm gear is located. If the crank is used to close the window tightly the worm gear pushes back on its housing with so much force it disconnects form the gear that drives the window arm. When that happens, the crank just spins in your hand and the operator needs to be replaced. Finished with the Truth hardware page ?